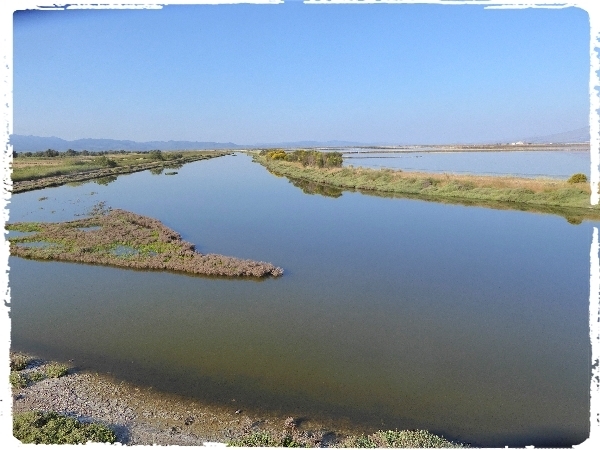 TSIKNIAS RIVER – KALLONI SALT PANS – TRANSFER TO THE AIRPORT.......... The final day was here, we awoke to a brilliant morning, a cloudless sky, perfectly calm with exquisite light, what a dream. 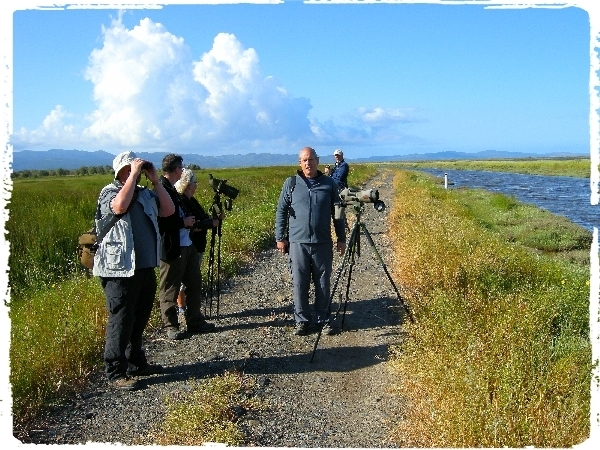 We had time for a few hour’s birding before driving to the airport so we made the most of it. 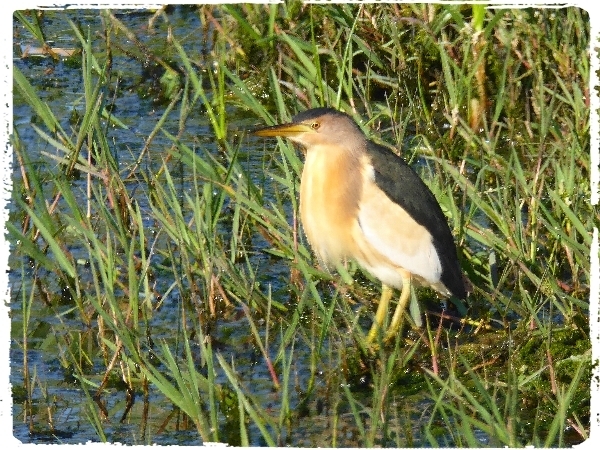 The Tisknias River was our first destination, it was superb, the weather brought out all river species, we counted many Little Egrets, five Little Bitterns, 4 Squacco Herons, three Purple Herons and singles of both White and Black Storks, Northern Shoveler, Mallard and countless Wood Sandpipers. Warblers were enjoying the sunshine too, singing, preening and squabbling over territory or mates, the Great Snipe was nowhere to be seen. 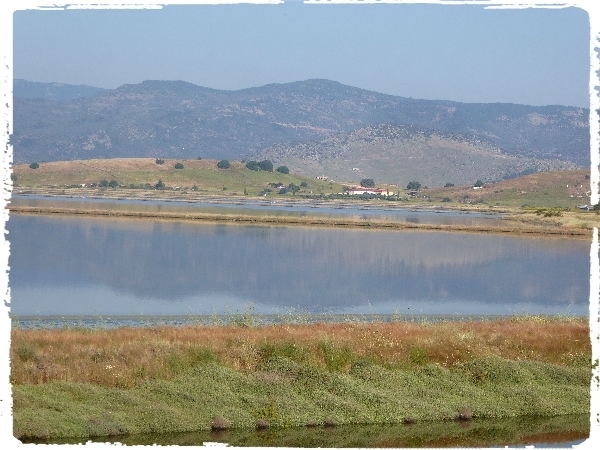 The eastern side of the pans were flat calm, like a painting, birds stood with perfect reflections, it was magical. I tried my creative best with digi-scoping this captivating scenery but failed to recreate anything like reality. The western side of the pans produced our final bird for the list, a Black-headed Gull, whoopee! Hey it’s fine to cheer this species when there is only one to be found, it was number 162 on the list. We had better views of the Red-necked Phalarope and excellent close views of both Temminck’s and Little Stints before we called it a day. 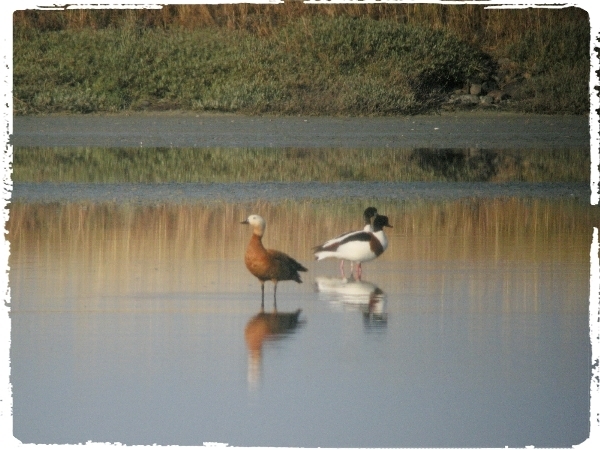 the two species of Shelduck - Ruddy (left) and Common - I assume that they are not speaking to one another after a tiff? Well that was it, the birding was over we drove back to the hotel, had breakfast, packed up the bus and went to the airport. The flight was on time, we arrived back in London, welcomed by a bright sunny day, how nice. We parted company at baggage collection, the trip was over.